During the early spring in Lappland, as the Sun gets higher and daytime temperatures rise, strange cages of chicken wire start appearing on balconies and outside houses. These contain strips of reindeer meat which have been salted and hung up to dry for a few weeks. Weather conditions are supposed to be variable for this process, with generally positive temperatures in the daytime but going below freezing at night. With the rather mild weather of late, a few of us in Tähtelä have already started. As you can see, the size and shapes of the home-constructed cages (needed to keep the birds away), and quantity and type of reindeer used varies quite substantially from the 5kg of reindeer hearts to a piece of steak. The results will be ready in a few weeks! The new Rector of the University of Oulu, Prof. Jouko Niinimäki, who is in office since 1st January 2015, visited SGO for the first time on Monday 23rd February 2015. 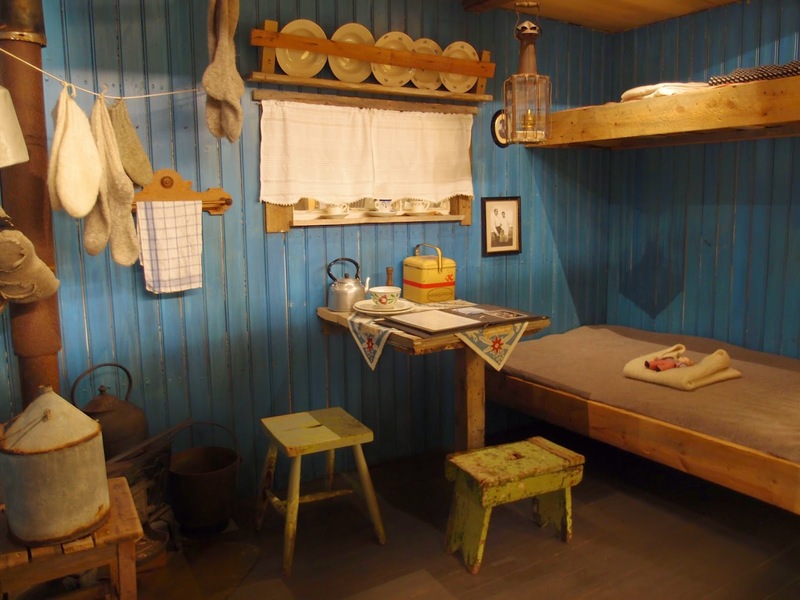 He was very impressed by what he saw at Sodankylä, including all measurement activities, which today span from Svalbard via Sweden, Finland and Ethiopia all the way to Antarctica. Rector Niinimäki stated afterwards that certainly he wants to visit soon again to learn more. 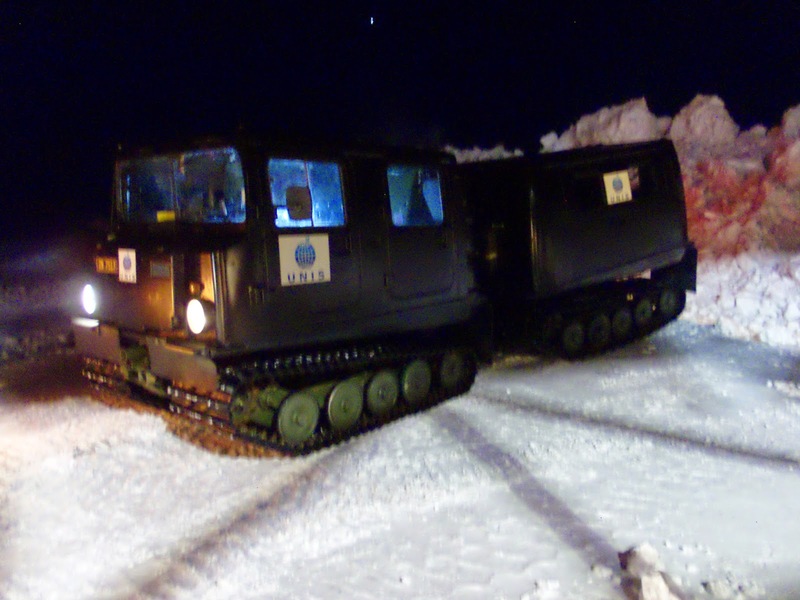 Furthermore, he wants to promote SGO's activities as part of concrete actions to reinforce the international status of the university in general and SGO in particular as a highly competent expert organisation in Arctic sciences. Text and photo: Esa Turunen. The 2015 space physics school is coming to an end. Tomorrow, we have three hours in the university and then football in BDU stadium. Hence, today was time to take group photo. Group photo of the space physics school. 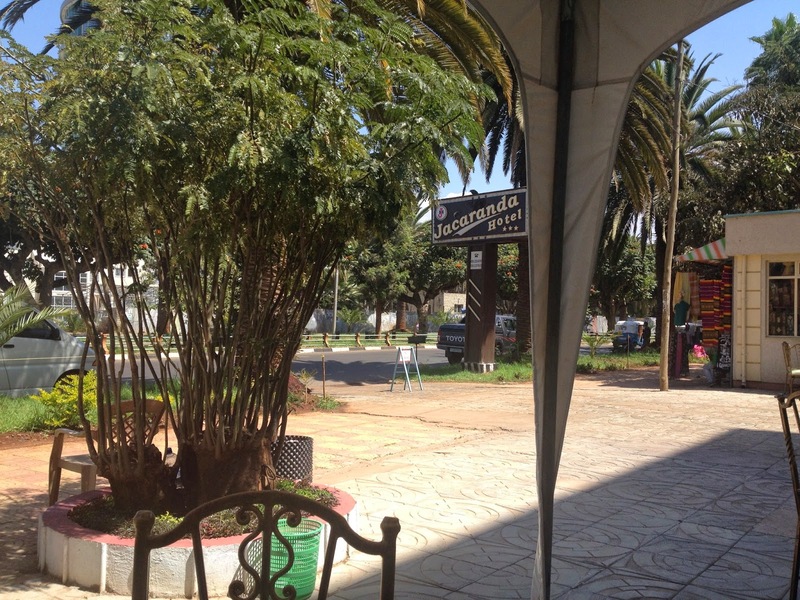 This week, me (Lassi) and Antti are down in Bahir Dar, Ethiopia, teaching in a space physics school. Other teachers in the school are Mike Kosch from South African National Space Agency and Mark Moldwin from University of Michigan (USA). Staff and students from Bahir Dar University will also present their studies. In the school, we shall cover riometry, tomography, incoherent scatter and many other near-space probing methods. The school shall take place in Jacaranda hotel, next to the beautiful Lake Tana. Hence, looking forward to a busy, but an interesting week! ... and naturally, according to the tradition, the week will end with a football match at the BDU stadium! We will post follow-ups later this week! A random view from the terrace of the Jacaranda hotel. For an interferometer such as KAIRA, the raw data product for imaging purposes is a set of "visibilities" which are essentially the cross-correlations of the voltages sampled by each antenna-pair in the array. These encode the amplitudes and phases of the interference fringes of any source in the field of view. An image is obtained via a Fourier-transform-type relation between visibilities and intensities (source brightness) known as the van Cittert - Zernike relation. For convenience, the antenna co-ordinates are converted into a set of baselines between each pair in a uvw co-ordinate system perpendicular to the source direction where u is towards the east, v is towards the north and w is towards the source. In the case of KAIRA all-sky images, the source direction is zenith. The image transform from the visibilities then creates a "flattened" image (orthographic projection) of the visible sky with co-ordinates l,m corresponding directly to u,v (the w direction is neglected in this case). The phase for a given point on the image and antenna baseline is simply the dot-product of the l,m co-ordinates of the point on the image (basically the normalised number of pixels from the centre in each direction) and the u,v co-ordinates of the antenna baseline (expressed in wavelengths in this case). The left-hand image above plots the phases for each antenna pair for the location of Cassiopeia A in an image from 16:00 UTC on 2013-12-27 (the image is Hermitian and so only one half is shown). These have not been arranged in terms of the array layout on the ground, but do show the alternate positive (yellow-red) and negative (blues) phases of the interference pattern. The maximum phase occurs for the baseline between antennas 43 and 34, indicated by the end of the white line. 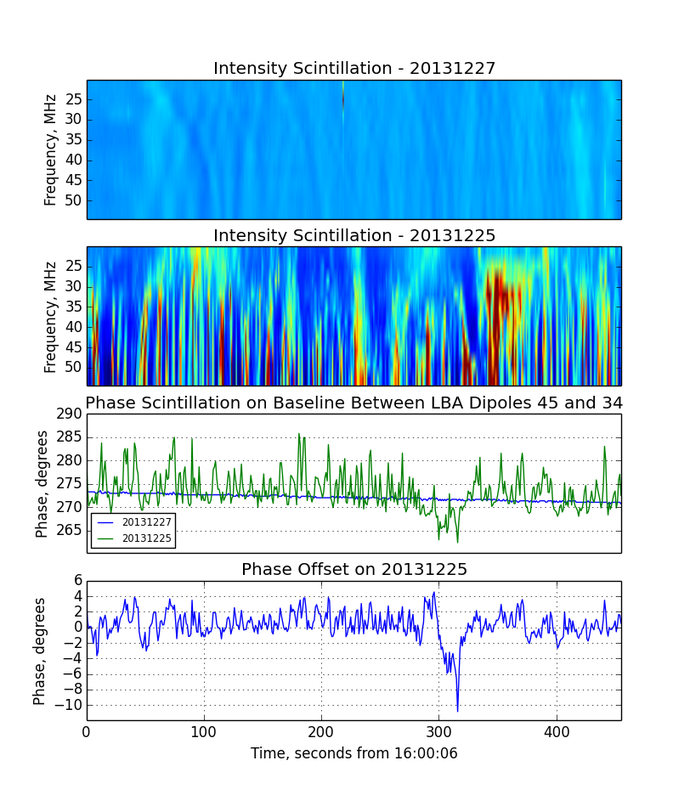 A plot of phase with baseline length for antenna pairs along this baseline is given on the right and shows the phase increasing with baseline length. 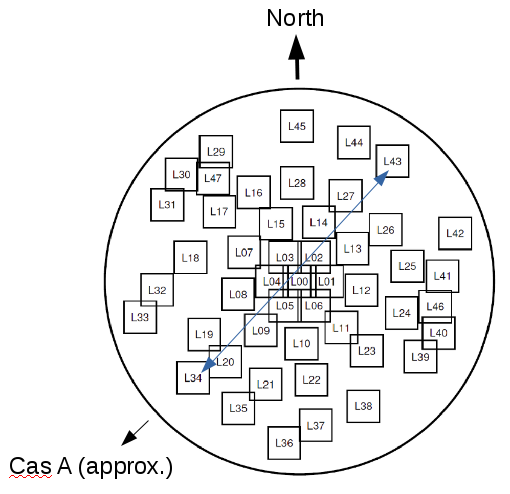 The plot above indicates the location and direction of this baseline on the array and demonstrates that this represents the closest baseline alignment to the direction of Cassiopeia A as seen in the image. 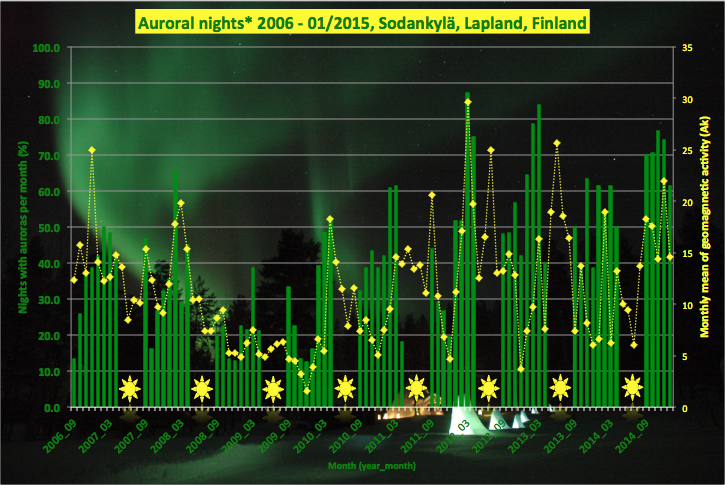 Below is the (updated) statistics of the northern lights in Sodankylä in Finnish Lapland. These statistics show the probability of northern lights. More detailed information can be found at http://www.sgo.fi/Data/AllSky/allskyFAQ.php. 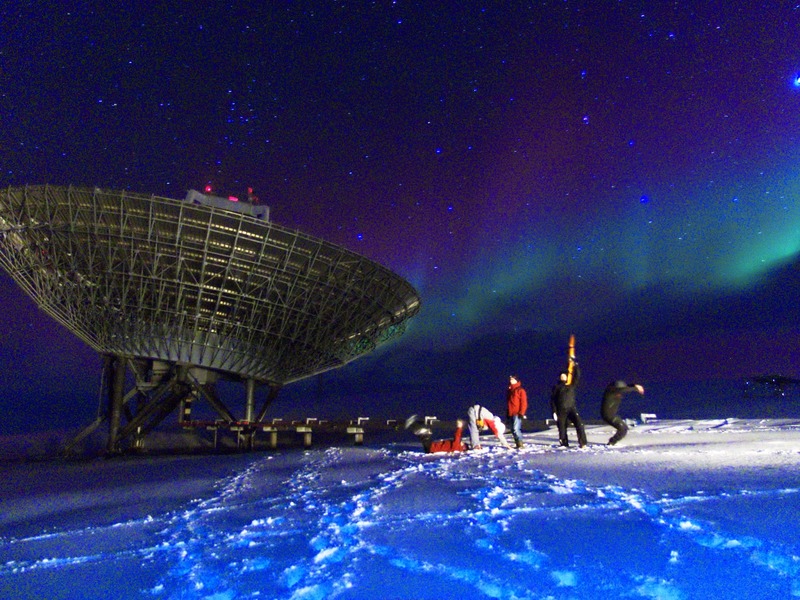 Recently, we have had rather strong auroral activity. As the weather in Sodankylä seems to be good this weekend, so we are looking forward to seeing some auroras! 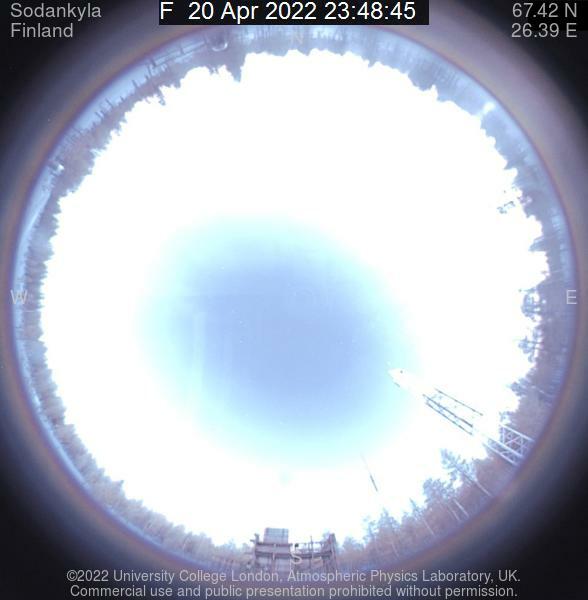 Ilmatieteen laitoksen vetämässä ionosfääritomografiaprojektissa TomoScandissa on kehitetty uusia menetelmiä ionosfäärin kuvantamiseen. Ilmatieteen laitoksen lehdistötiedote projektin viimeisimmistä käänteistä julkaistiin tänään IL:n sivuilla. Lehdistötiedote löytyy täältä. J. Norberg, L. Roininen, J. Vierinen, O. Amm, D. McKay-Bukowski, M. Lehtinen. 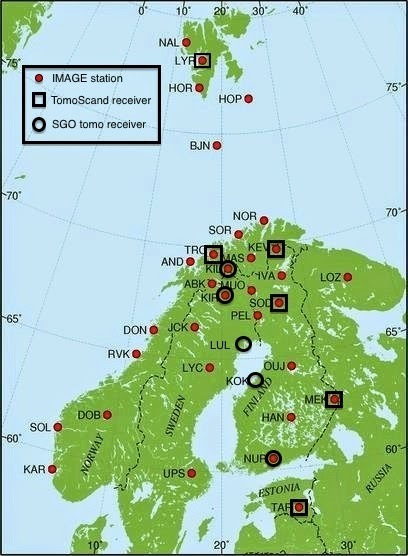 Ionospheric tomography in Bayesian framework with Gaussian Markov random field priors. Radio Science 01/2015, DOI: 10.1002/2014RS005431. J. Vierinen, J. Norberg, M. S. Lehtinen, O. Amm, L. Roininen, A. Väänänen, P. J. Erickson, D. McKay‐Bukowski. 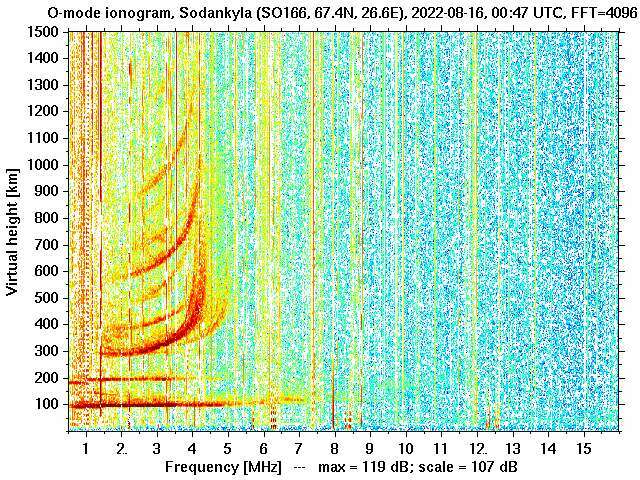 Beacon satellite receiver for ionospheric tomography. Radio Science 10/2014, DOI: 10.1002/2014RS005434.